This fascinating new book is much more than a price guide. Filled with never-before-seen vintage photos, legends, and rodeo lore, the first part of the book is the complete history of the First Ladies of the Great American West. It then goes on to illustrate in stunning color photos, hundreds of collectibles and rarities that are accompanied by detailed captions. A price guide in the back is helpfully included to aid in valuing. 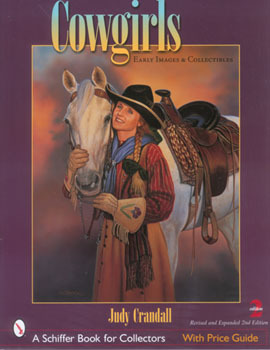 For any fan of the Wild West, Western collectibles, the rodeo, and girl power, this guide is a must.